Kicking off our Centennial year, the Centennial web page has officially launched. 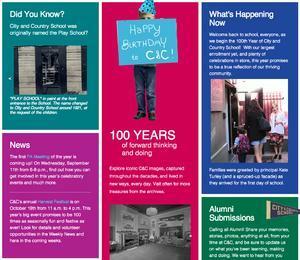 This is the source for all things Centennial-related: news and events, interesting factoids about C&C, a visual look at the school then and now, how to volunteer, alumni submissions, and MORE! Be sure to visit often as we get deeper into the year for event details, children's work, and more fun photos and tidbits! To visit, click on the above link, the screenshot below, or on the birthday cake from any part of the C&C site.